History: (Thor Annual#2) - The Warriors of the Thousand Galaxies are four brothers, each with special talents. When Odin prepared to hold the Tournament of Titans in Asgard, with suits of gold armor as the prize, the four of them came to Asgard to pit themselves against the best warriors the city could offer. 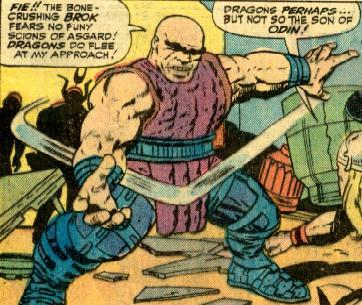 The four warriors immediately found sport in combatting the patrons of an Asgardian bar, and found the Asgardians there weak. Thor and the Warriors Three soon arrived and grappled with them. However, the battle soon ended when Drom observed that they should wait to face the Asgardians in the tournament. The brothers agreed, and Brok announced that he would face Thor in battle; Galp chose Hogun; Tyr chose Fandral; Volstagg, who had hid during their earlier battle, thus chose Drom to be his foe. Drom remarked: "Think twice, buffoon! Perhaps there be one yet smaller than I!" 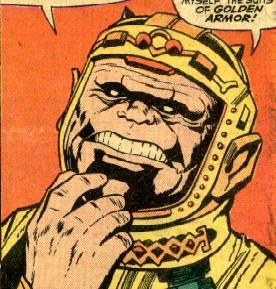 But the courageous Volstagg answered: "Nay! Size means nothing! Big as thou art, I shall fight thee!" 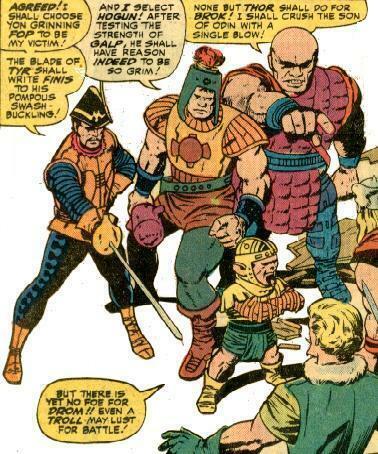 As the tournament began, Brok, Galp and Tyr came up behind Volstagg and struck him down. Volstagg had been warned by the crowds, but thought they were cheering for him. The four brothers again confronted Thor and the Warriors Three and set to battle, each facing the one they had chosen beforehand. Volstagg attempted to battle Drom, but was frightened when Drom assumed the form of a giant monster. Volstagg cowered in fear, not realizing it was an illusion. When the illusion faded, Volstagg gave chase again-- straight into the Destroyer! Mistaking him for Drom, Volstagg charged into battle, only to be brushed aside by the unstoppable machine. After the Destroyer was defeated by Odin he proclaimed all of the warriors who partook in the Tournament of Titans to be true heroes, and made all of their armors glow golden for a moment so that they could share that glory. 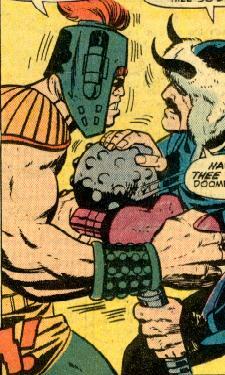 Brok the Crusher was the brother of Drom, Galp and Tyr. He was particularly strong, and claimed that dragons fled at his approach. He chose Thor to face in combat as he was the strongest of the Asgardians. Drom the Spirit-Weaver (or "Weaver of Spirits") was a troll, and brother to Brok, Galp and Tyr. Drom possessed the ability to cast certain spells, including illusions. He faced Volstagg in battle, as Volstagg assumed that he was the weakest of the four as he was the smallest. Galp of the Steel Arm was the brother of Brok, Drom and Tyr, and wielded a large mace. 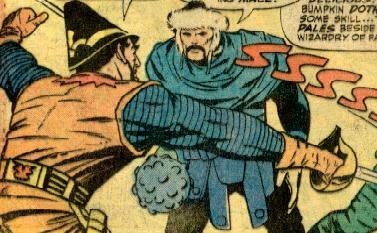 He chose Hogun the Grim as his opponent, as they both bore maces. Tyr of the Burning Blade was the brother of Brok, Drom and Galp. He was a master swordsman, and chose Fandral the Dashing to face in combat, as they were both swordsmen.